One of the big four cellphone network providers in the US. Offers the second most reliable network in the US. Expect good coverage and reliable speed. 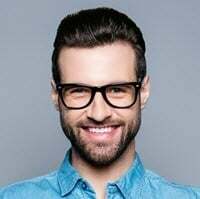 Has unlimited and flexible plans with the option to connect up to four lines. Includes plenty of freebies that add value (such as discount on DirectTV). For my family, having a cell phone plan was never necessarily difficult. Because we’re 7 people in total, it is greatly cost-efficient for us to continue using family plans wherever that may be. As a result of this, we’ve often found ourselves staying in contracts with providers that give us a good variety of features that benefit everybody in the family. What are AT&T data plans? How to change my AT&T plan? How do I know what AT&T plan I have? How much does AT&T charge for going over data plan? Can I use a Verizon phone with AT&T plan? Do all AT&T smartphones require data plans? Can I change my AT&T data plan anytime? Can I add data to my AT&T plan? Does AT&T have unlimited data plans? How much is AT&T unlimited plan? What is AT&T unlimited plus plan? How does AT&T unlimited data plan work? Is AT&T unlimited data plan worth it? How many lines can you have on AT&T unlimited plan? Does AT&T unlimited data plan include tethering? Does AT&T unlimited plan include hotspot? How does family plan work AT&T? Can my parents see my text messages AT&T family plan? How to cancel AT&T family plan? Does AT&T have friends and family plan? How to remove a phone from AT&T family plan? How many phones on AT&T family plan? How does the new AT&T family plan work? How does AT&T Next plan work? What is AT&T Next plan? How do I get out of AT&T Next plan? What is AT&T Next installment plan upgrade? How does AT&T installment plan work? How much to add an iPad to AT&T plan? How to remove device from AT&T plan? Does AT&T have prepaid plans? How to use AT&T passport plan? Can I use a GoPhone on my AT&T plan? Can you use a prepaid phone on a plan AT&T? Does AT&T have senior plans? How does AT&T no contract plan work? How does AT&T GoPhone plan work? How does AT&T international plan work? How much is AT&T international plan? What is AT&T passport plan? How to add a data plan to AT&T GoPhone? How to renew my AT&T prepaid plan? Does AT&T have no contract plans? Is Puerto Rico included in AT&T plan? Is Hawaii included in AT&T nationwide plan? Does my AT&T wireless plan cover Canada? What is the cheapest AT&T landline plan? Will AT&T match T-Mobile plans? How do I track a phone on my AT&T plan? Though there are many different types of services (such as Mobile Virtual Network Operators) that allow you to meticulously plan every aspect of your phone contract, sometimes it is better to stick with the major companies (Verizon, AT&T, T-Mobile, Sprint) as they typically provide you more benefits depending on how much you invest in the company. In our situation, this typically makes perfect sense, as you can’t really find a plan that accommodates for 7 people efficiently and affordably, making signing on with a major phone service provider a necessity. However, even within the major manufacturers there are discrepancies about which services are truly the best ones to invest in. Throughout the past 10 years we have switched from Verizon to T-Mobile and onward, eventually settling on a plan with AT&T. We have since had our AT&T plan for 4 years now, extending our 2-year contract once. Now that we’re at the end of our extension, though, I figured it would be a good time to take a step back and strongly analyze the service we’ve received over the past few years. Before I go into our specific thoughts about AT&T, I want to elaborate about the different types of options they have. As of right now, the plan we have had for the past 4 years is the “AT&T Unlimited & More Premium Plan”, a type of contract that allows you to pay around $50 per phone line. For us, we were able to expand what is typically a 4-line contract to be 7-lines, a benefit that has allowed us to easily gear our specific situation to our interests. We were also able to make use of an unlimited data option on our plan, something that allows us to get the most out of the service we want without having to pay much more than we would with a data cap. 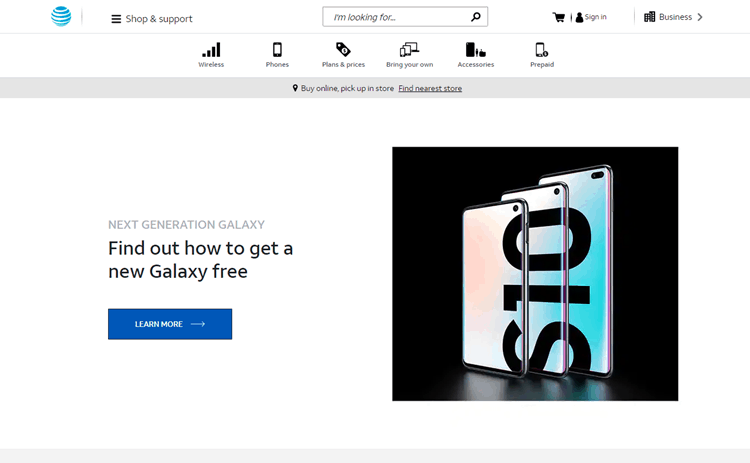 The biggest benefit of this service, though, is the ability to be able to upgrade our phones after a year or so, depending on when the phone was received. The main reason why we switched to AT&T in the first place is that we wanted to be able to take advantage of the increasing trend of iPhones and the various improvements associated with smart phones. At the time, the best plans and cheapest rates for iPhones were on AT&T, therefore requiring us to switch our plan. However, if you choose this plan you’ll find that you’re mainly bound to the phones that AT&T offers, making it nearly impossible to use outside phones for your plan. This is because many of the mainstream telephone providers typically lock the SIM card features of their phones intentionally, forcing you to have to commit if you want to stay with the company. This doesn’t mean that you have to choose a plan that locks you into a contract, though. AT&T also has many different types of prepaid plans, such as their 8GB of high-quality LTE data for $50 a month. There are also other types of plans that allow you to stay on a contract with less people involved or even by yourself, something that ends up giving you many different ways to work with AT&T if you’re curious about it. That being said, we want to tell you our thoughts about the service itself. The amount of plans available is surely varied and can give you a variety of experiences, but we think the most important aspect of choosing a phone plan is making sure that the actual service you’re paying for is of high quality. This is because that many of the mainstream providers offer convenience, but typically at a high price—so, without further ado, here are our thoughts on the AT&T service. Something to immediately address with AT&T’s overall service is the coverage. Depending on where you are in the US, your mileage may vary. For example, our family has consistent coverage in most of the east and west coasts, but then there are dead spots in less populated areas of the country such as Vermont and Maine. This can be a deterrent when traveling in more rural areas, as typically it’s more important to have coverage in areas that are less populated in case you get lost. Another area that I’ve consistently found myself without coverage in was the deep south, particularly the rural areas. I wish that AT&T would build more cell phone towers in these rural areas of the USA, but as of right now it’s fine because what the company does, they do well. The areas in which they do have service tends to be incredibly reliable and smooth. For example, in New York City (where I currently live), I’ve never had trouble receiving 4 bars consistently unless I’m deep in the subway. This is good for those moments that I’m on-the-go and need to reliably be on the phone in changing atmospheres or buildings that might have different amounts of coverage on other services (something that was noticeable when we used to use T-Mobile, for instance). With almost no dropped calls, I can say that AT&T gives us a good reason to not worry as much about inconsistency. Another aspect of AT&T that I’m not so excited about is the lack of international coverage. I spent a good amount of time traveling through Europe recently with a friend and—while they were able to enjoy and purchase prepaid phone plans for any country that we were traveling through, I consistently found myself with no service, something that was incredibly inconvenient when I wanted to be able to purchase data at certain moments. Sure, AT&T has plans that you can select that include international coverage, but the lack of flexibility in being able to charge directly to your bill on top of your contractual plan made me feel like I wasn’t getting the best service I could get. That being said, the main faults that AT&T has are the aforementioned ones with coverage. The overall service is incredibly high-quality and shows why AT&T are one of the leading companies with regards to providing a consistent, quality service. The phones they offer are also great deals. With our family plan, we were able to get multiple iPhones for free with our contractual obligations. Though we had to choose some of the more outdated models, the features are still incredibly helpful and vastly outweigh the potential letdowns of having an earlier edition of a phone. You can pay to have one of the newer models of phone for a discounted price, but it is still too much for us to feel comfortable paying. The best part about buying phones from AT&T that come with your plan is that you’re essentially rewarded by being eligible for upgrades every year or two years. Sometimes the upgrades even give you different options, allowing you to have certain phones at no additional charge or having some pretty high-end smart phones at a very discounted rate. 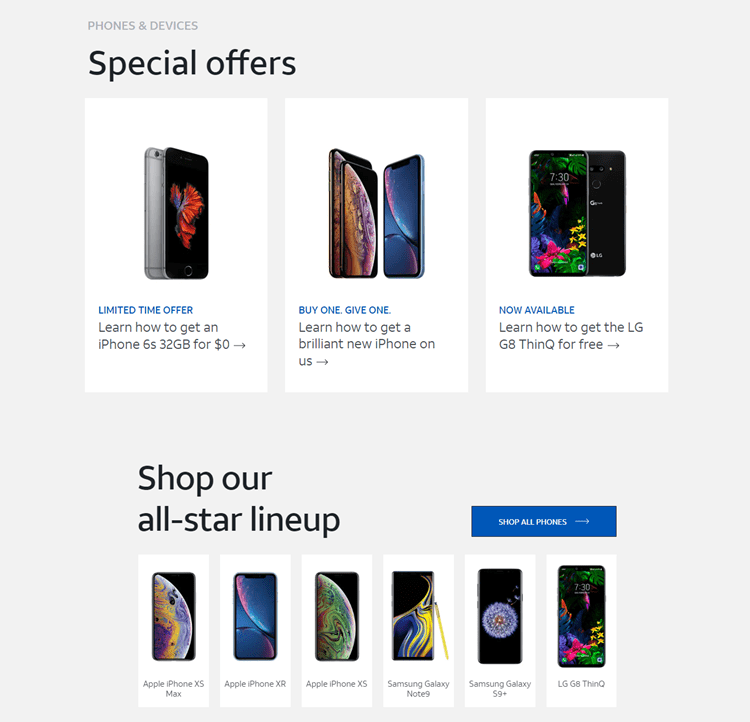 These are the types of benefits of having a contract that I really appreciate when looking into a phone plan, as it gives everybody in my family a great deal of customization and variety without the potential upset of committing to a phone that you may not enjoy as much a year or so after getting it. These aspects of AT&Ts services are great for those who are increasingly distraught by the rising prices of additional benefits in phone plans. The only thing required when choosing to use AT&T services is that you have to commit to the plan itself, something that might be too much for some and become an immediately prohibitive factor. Another aspect of AT&T’s overall service that is less-than-ideal is the customer support. Almost every time I have tried to call AT&T over the past 4 years I am either put on hold for extensive periods of time or given the runaround for issues that I could easily find solutions to by posting on the internet. To have to go elsewhere to get answers that the service itself should be able to provide me isn’t the most endearing quality and makes me feel slightly used as a customer. I should note, though, that I’ve had numerous good experiences going to their stores in person, but feel that I shouldn’t have to drive out of my way to go to an AT&T store simply because I have a small question about my phone. Like many mainstream service providers, AT&T is able to provide the consistency and quality service that gives it the brand popularity it’s maintained strongly in the new millennium. However, one of the main drawbacks of these benefits is the essential requirement of staying contractually obligated to the service. Though there are prepaid plans that you can select, the price is significantly higher and you’re really only getting a deal if you stick to a family plan or a high commitment contract. For many who are intimidated by the commitment or are unsure about how much they’ll actually need their phone on a regular basis, I don’t recommend using AT&T. It has great consistency and overall service, but at the end of the day, it’s just not worth the money unless you know that you’ll be making the most of it. However, if you’re somebody who is looking for a good family plan-oriented service that makes having cell phones in large numbers affordable, then AT&T is certainly a right service for you. One suggestion that we have, though, is to make sure every feature you want is implemented into the contract you sign—for example, having international coverage is possible, but certainly not accessible unless you specify this requirement in your initial contract. This will surely cost you more money, but the ease of mind you receive is worth it. 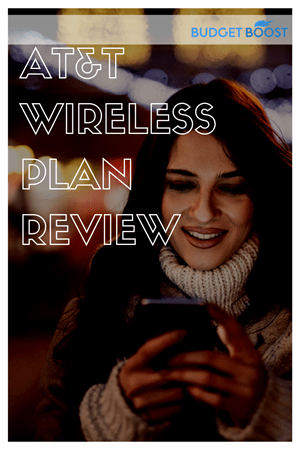 We hope this AT&T Wireless Phone Plan Review was helpful and that you’re able to keep our input in mind the next time you’re deciding which phone plan to choose! This section will cover the basics about AT&T cell phone plans. Use this section to get a better idea of what plan might be best for you. AT&T has four different data plans. Two of them are unlimited plans, the Unlimited & More Premium and Unlimited & More plan. AT&T also offers the Mobile Share Plus 9GB and Mobile Share Plus 3GB plans. There are two ways to change your AT&T plan. First, you can go online to your account and change your plan from there. You can also go to any AT&T store to manage your account. The best way to find out what AT&T plan you have is to log on to your AT%T account online. You can also go to an AT%T store to get information about your account. AT&T recently eliminated overage fees for customers. Instead of charging you more, your speed will be throttled to 2G speeds for the rest of your billing cycle. No – Verizon is a CDMA carrier, while AT&T uses GSM. These different technologies aren’t compatible with each other. No – however, without a data plan you won’t be able to use most of the features on a smartphone if you’re out of range of a Wi-Fi network. Yes – you can use your account online or the myATT smartphone app to change your data plan. However, any changes won’t be effective until the next billing cycle. Yes – you’ll need to log on to your account or go to a store to see what the specific cost and options will be for your current plan to get data added to it. We’ll answer the most common questions about AT&T unlimited plans in this section. Yes, AT&T offers two unlimited plans. Their Unlimited & More plan costs $80 per month with autopay and paperless billing discounts. The Unlimited & More Premium plan costs $70 per month with the same discounts. AT&T’s unlimited & More Premium plan costs $80 per month when you include autopay and paperless billing discounts. Their Unlimited & More plan costs $70 per month when you apply the same discounts. 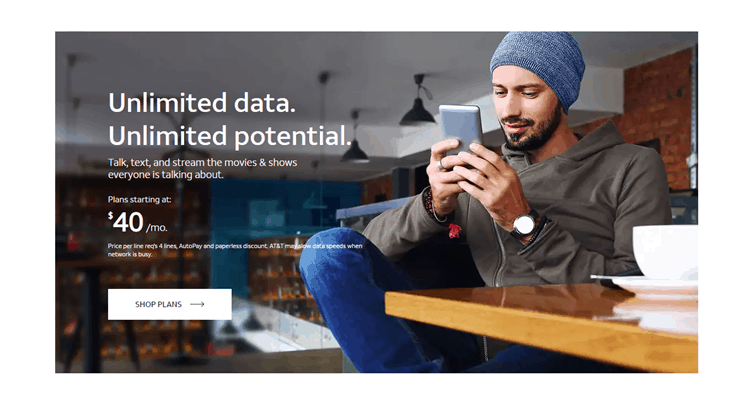 AT&T now offers the Unlimited & More Premium plan, which gets you all the benefits of the Unlimited & More plan plus 108p quality, a 15GB hotspot, and a subscription to one of seven movie or entertainment services. The AT&T Unlimited plan gets you more than 35 channels of live TV and doesn’t have any overage fees. Your video streaming is limited to 480p DVD-Quality. You get unlimited texts to 120 countries and unlimited talk, text, and data in Mexico and Canada. That depends what you’re looking for in an unlimited plan. AT&T offers lots of great entertainment bonuses with their unlimited plans, and allows free talk, text, and data in Mexico and Canada, so if those are priorities for you, then it’s probably worth it if you get the discounts. AT&T gives pricing on their website for up to four lines per unlimited plan. The price goes down per line as you add lines, all the way to $40 per month per line with four lines. AT&T Unlimited & More Premium includes a 15GB hotspot, but this costs $10 more per month than the Unlimited & More plan, which doesn’t include tethering. Only the higher tier AT&T unlimited plan includes a hotspot. This plan costs an extra $10 per month compared to the other unlimited plan that doesn’t come with a hotspot. AT&T Family Plans are incredibly popular. This section answers your questions about AT&T Family Plans. AT&T offers two family plans. There’s the Mobile Share Plus Data plan, which gets you 4GB for $30 per month for 4 lines, or a 9 GB version for $35 per month. They also have prepaid family plan options. They cannot log on to their AT&T account to view your text messages. However, they can still read text messages directly from your computer. The easiest way to cancel an AT&T plan is by calling 800-331-0500, saying cancel service when prompted, and then follow the prompts to cancel your plan. AT&T offers multi-line discounts on all of their plans which allow you to add up to five lines per plan and save up to $110 per month. AT&T requires you to call them to cancel any line. You can find the customer service number to call on your bill, along with the number associated with the device you want to cancel. Mobile Share Plus customers can have up to 10 lines and AT&T allows from 5-10 lines on their unlimited plans. The Mobile Share and Mobile Share Plush family plans offer up to 10 lines for a $20 access charge for each line. You pay $30 per month for 3 GB of data or $35 per month for 9GB of data. The Next Program lets you get a new smart phone every year. You make a trade in and possible a down payment and have the rest of the cost of the phone divided into payments on your bill. The AT&T Next plan is a way for you to continually finance a new phone on your AT&T bill which lets you get a new phone every year. You can manage your Next plan from your online account by going to Account & Services and My Wireless. Click the device on which you want to cancel the Next plan and you’ll see the option to terminate the plan. Keep in mind that this may come with an early termination fee. The Next plan upgrade lets you finance a new phone every year by turning in your old phone and putting monthly payments for your new phone on your monthly bill. The AT&T Next plan lets you trade in an old phone and finance a new phone in a way that lets you always have the latest phone. The price of the phone is added to your monthly bill, and the service may require a down payment. Tablets are better with data – we’ll answer questions about AT&T data plans for tablets in this section. That depends on what kind of plan you have. It can cost as little as $20 or as much as $60 based on your specific plan. You need to call AT&T to remove a device from a plan. You can find the number to cancel and the information for the device you want to cancel on your cell phone bill. AT&T has a lot of plans on offer – we’ll answer questions about some of their other plans in this section. Yes, there are several options for prepaid plans from AT&T. The price of the plan depends on how much data you want for the month. Unlimited Data starts at $85 per month. Passport lets you pay a one-time per-device fee to use your device for up to 30 days in over 200 countries. It includes talk, text, and data. You certainly can. You just need to get a free replacement SIM card at any AT&T store. Yes – as long as it’s an AT&T prepaid phone. Other types of prepaid phones may or may not be compatible with AT&T. Yes, the Senior Nation plan costs $29.99 per month and gives you 200 anytime minutes, unlimited nationwide calling to AT&T mobility customers, 500 night and weekend minutes, and includes other features. The no contract plan for AT&T works by charging you before you use minutes, as opposed to a regular plan where you are charged after your billing cycle starts. You can choose to cancel anytime. There are lots of different ways to use a GoPhone – you can have a $2 daily plan where you only get charged on days you make or receive calls or texts. You can also have a per-minute or per-text plan. AT&T Passport lets you use your talk, text, and data in more than 200 countries by paying a per-device fee. This gives you 30 days of unlimited talk, text, and data. The price of the AT&T Passport plan changes depending on your current plan and device. The plan charges a per-device fee for 30 days of unlimited talk, text, and data in over 200 countries around the world. The AT&T passport plan is designed for someone doing long-term overseas travel. It gives you unlimited talk, text, and data in more than 200 countries for a per-device fee. The best way to add a data plan to your AT&T GoPhone is to call 611 from your AT&T wireless phone, follow the prompts and say Account Changes. Follow the prompts again and pick Buy Add-Ons. This will let you pick a data plan. You can renew your plan by logging on to your account or going to any AT&T store and following the instructions given. Yes – AT&T no contract plans are covered under AT&T Prepaid. You can get a plan and phone with no credit check, activation fee, or annual contract. Yes – Puerto Rico is considered part of the US according to AT&T plan coverage. Yes – AT&T Nationwide cell phone plans include Hawaii as being covered. It’s the whole nation, not just the lower 48 states. In many cases, yes. It depends on your specific plan though, so you should be sure to check before you assume you’re covered. There are some questions that don’t fit into our other categories – we’ll answer those questions here. The AT&T Protection Plan covers protection against loss, theft, physical and liquid damage, as well as out-of-warranty malfunctions on the covered device. The lowest-priced landline plan that AT&T advertises is the complete choice basic. This comes at $37 per month and includes unlimited local calling, caller ID and call waiting. No, AT&T doesn’t match plans with T-Mobile or Sprint. They claim that neither company has service that matches AT&T’s, so they can’t match prices. Only certain devices have tracking features. If you have an iPhone you can go to Find MY iPhone on iCloud.com. This will show you where your device is.